The storms in late February and early March really did a number on the trails. 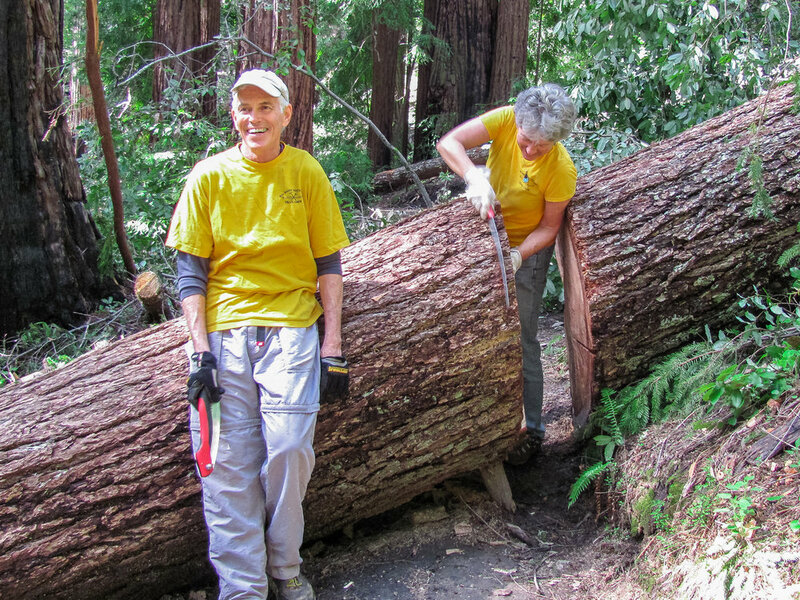 The Park brought in the CCC to help opening Skyline to the Sea (STS) trail, but there was plenty for the crew to take care of. Not only did the storms being the rain and wind they also brought out the crew with 21 members including some first timers showing up. The crew was split up into 3 crews with Chris Young, Dale Stadelman (Crew1), Dale Petersen (Crew2), and Mike Peasland, Norm Beeson (Crew3) leading crews. With many reports of the extensive trail damage from Kurt Leal and Chris P. we came prepared for a full day of trail work. There was the question of where exactly the BBVTC should focus their efforts for the day as Skyline to the Sea and Sunset Trails were closed due to extensive washouts and trees down. It was apparent that a full days work, even with our full crew would not allow either of those trails to be open. Ranger Alex conferred with us as well to try and use the volunteer time as effectively as possible. It was gratifying that we had so many members show up to help. Word of the Park's need had spread. We decided to spit into three groups. My group returned to last months site that we ran out of time on, just beyond the Sunset Connector. It did not sit well with us to leave the trail work in a half finished state there. With D2's 24" bar on his Stihl we were much better equipped to deal with that Doug Fir. Also joining us were Jan Hill, Mike Lanthier, David Bryan and first timers, father and son, Marcos Cabrera and Marcos Jr.
We took the Gazos Creek fire road up to Middle Ridge Road and found those to be in fairly good shape with just a couple patches of mud to get through. Patrick from Park operations joined our group on the way up. 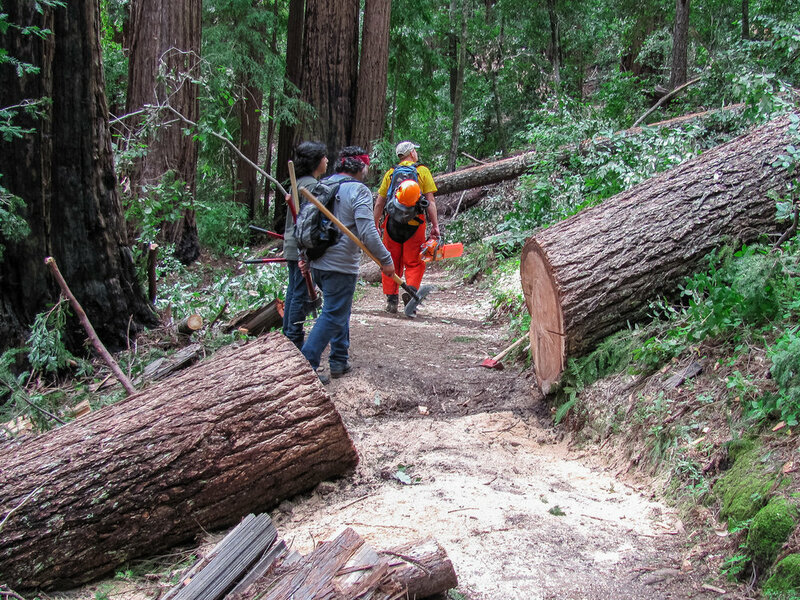 He was pleased to learn that Marcos and son had learned of trail crew day from the Big Basin Facebook page. We hiked down Sunset to the connector and came across a major slide that had completely obliterated a portion of the Skyline to the Sea Trail. Where Sunset Connector met up with Skyline to the Sea was gone. Major slide on the Sunset-STS connector trail. Base of the Sunset Connector landslide. Maybe 400 feet by 600 feet of downfall. Open canopy. Trail will need rerouting. Patrick, Michael and I started clearing where the trail was blocked. Dale, Jan, David, Marcos and son cleared a bit as they picked their way through the debris to get to STS. Patrick had to return to HQ a little before 1pm to finish some paper work. Michael and I finished clearing the path down to STS with a little improv work to make the connection. Meanwhile Dale's group got to the intended work site and made short work of the cut I started last month. He left my one chiseled out side as a memorial to the effort I put in. The portion below the switch back they saved for after lunch. Michael and I met up with them for lunch and helped out clearing the downhill portion afterwards. While the rest of the group finished the downhill portion of the site, Michael and I went a little further down the trail to clear out a small Tan Oak I remember from Kurt's report last month. is the lignin-degrading enzyme system of this fungus. The fungus decays the lignin in plants and leaves the cellulose behind. The fungus has a very high optimum temperature (about 40 C), which means it can grow on wood chips in compost piles, which reach high temperatures. We put the finishing touches on the work and by that time it was just after 3pm. By the time we hiked out and drove back to the tool shed it was nearing 4pm and it was clear we didn't have time to start anything else new. For which I'm sure we were all much relieved as the work had been strenuous. On the way out we heard chainsaws at work along the Gazos Creek fire road. It seems the CCC was already hard at work themselves on the trails. There had been discussion of adding a second work day for the BBVTC this month but with the CCC on site it seemed prudent to let them go at it and see what needed work next month. Many thanks to all the volunteers who came out and helped work! 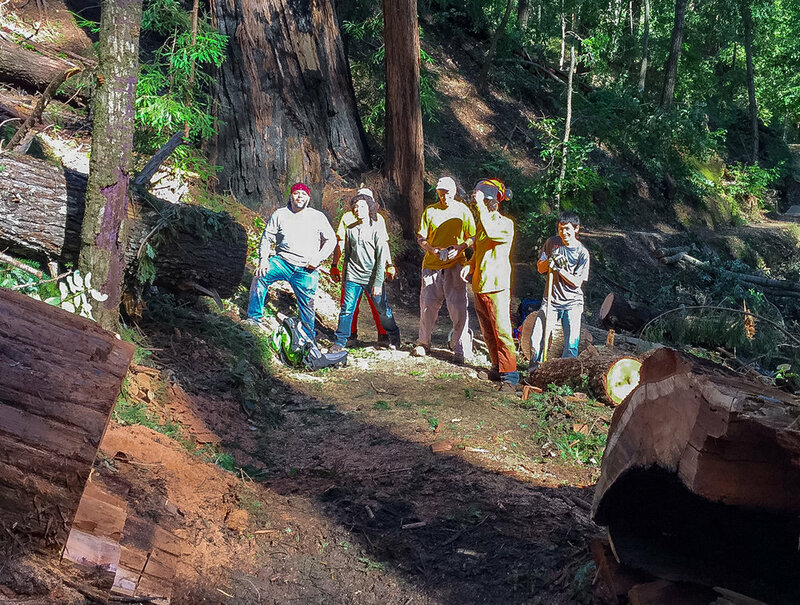 Dale P's crew drove up to China Grade to check on a series of problems on the Basin Trail. 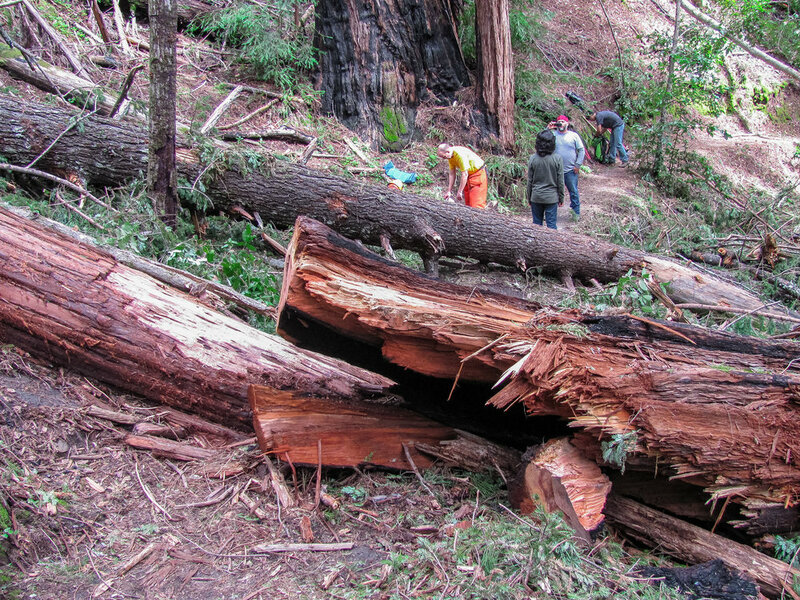 The good news is they cleared 12+ trees as they hiked from Lane Trail Camp to STS, but they didn't have time to deal with several severely overgrown stretches of trail, so we'll need to schedule some brushing work before the weather turns warm. Meanwhile Norm and Mike's crew headed along Skyline-to-Sea from the Gazos Creek Picnic in pursuit of other problems. The first stop was the Creeping Forest Trail where they discovered the conservation corp that started work in the park the day before beat them to a large down tree that had fallen in the exact same area we had worked in February. Continuing along STS they dealt with some small things before stopping for lunch at the Maddock Cabin Site. There was a report the foot bridge connecting STS to North Escape Rd in the area had been washed out, but fortunately they found it cabled to the bank and were able to reposition it just in time for a group of hikers to give it a test drive. A little further along they found a slide had covered the trail and there were a couple of small trees that needed to be removed in order to make the area passable. The crew put in 198 hours on a hard work day. Thanks to Norm Beeson, David Bryan, Jan Hill, Michael Lanthier, Janie Liefhelm, John Martin, Jordan McDaniel, Janette Mello, Mike Peasland, Dale Petersen, David Philleo, Dale Stadelman, Randy Lloyd and Chris Young, for their efforts. And welcome to a record seven first timers in a single workday - Marcos Cabrera and his son Marcos Jr, Suchit Kaura and a couple of Scouts, Vibhav Kaura and Nihal Singh, Serena Sinclair and Lee Thackston. . Great Day.